How to explain the figure above? I'll use the start sequence of a JT-9D on a 747-200 as an example. It's typical, and since there was no FADEC and since it took two people having to manually do the individual items that will better explain things. The f.e. turns on the engine ignition switches to energize the igniter that will ignite the fuel when introduced. The figure doesn't show the next step, that of starting the engine rotating. The f.e. did that by opening the start valve which directed pneumatic air into the starter. Starter operation was confirmed by the f.e. observing N2 rotation—the figure calls that the compressor. Some gas turbines use an electrical starter rather than a pneumatic starter. At 30% N2 rotation, the captain opens the fuel valve and light-off occurs. The captain and the f.o. 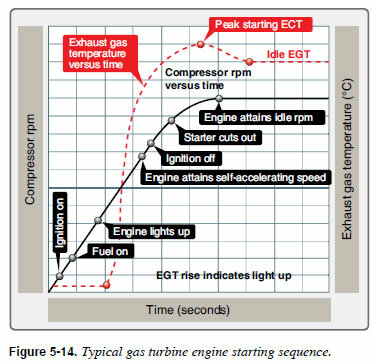 monitor the EGT to confirm light-off and to avoid an overtemp—the figure calls that the Peak Starting EGT. At 50% N2 rotation, the engine can accelerate on its own. The f.e. turns off the igniter and closes the pneumatic vale supplying air to the starter. The engine continues to accelerate on it's own to idle rpm. All sorts of things can go wrong, and you practiced those things in the sim, and occasionally you had to contend with them in real life. Not the answer you're looking for? Browse other questions tagged aircraft-maintenance engine turbine or ask your own question. When does a turbine need to go to maintenance? Why does gas turbine engine have pressure oil supply tube and the scavenge oil tube? Is my understanding of a gas turbine engine compressor correct?